Luana Savings Bank has begun construction on a new branch facility in Ossian, IA immediately adjacent to the current facility. 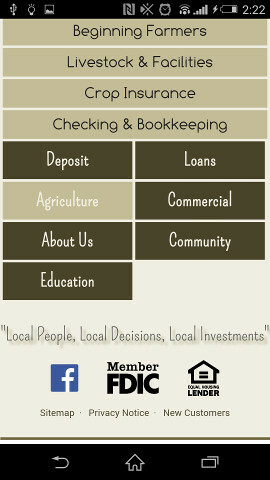 As Luana Savings Bank continues to grow, we also deepen our roots in the local, rural communities that we serve. 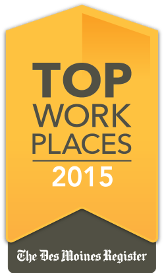 Luana Savings Bank has been awarded a 2015 Top Workplaces honor by the Des Moines Register. The Top Workplaces lists are based solely on the results of an employee feedback survey administered by WorkplaceDynamics, LLC, a leading research firm that specializes in organizational health and workplace improvement. Several aspects of workplace culture were measured, including Alignment, Execution, and Connection, just to name a few. "The Top Workplaces award is not a popularity contest. And oftentimes, people assume it's all about fancy perks and benefits." says Doug Claffey, CEO of WorkplaceDynamics. "But to be a Top Workplace, organizations must meet our strict standards for organizational health. And who better to ask about work life than the people who live the culture every day - the employees. Time and time again, our research has proven that what's most important to them is a strong belief in where the organization is headed, how it's going to get there, and the feeling that everyone is in it together." Claffey adds, "Without this sense of connection, an organization doesn't have a shot at being named a Top Workplace." David Schultz, President of Luana Savings Bank, comments on the award, "Every institution's success starts at its core. Employees who feel respected, appreciated, and connected to their workplace will drive the business forward and we certainly realize this here. We have such a great staff and are honored to receive this award – it reaffirms that we are providing a healthy work environment and a promising future to both our staff and our customers." 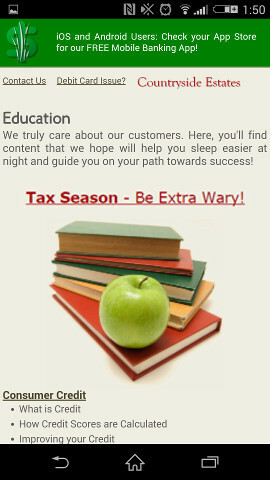 To learn more, visit www.topworkplaces.com and www.workplacedynamics.com. Luana Savings Bank has once again received the Bankrate.com® Top Tier award for consistently offering annual percentage yields (APYs) that were among the highest reported in 100 Highest Yields® for 2nd quarter 2015. Luana Savings Bank was ranked 3rd nationally for two deposit products. Institutions that most often provided the highest yields for nationally available MMAs and CDs that can be opened by mail/phone during the 2nd quarter of 2015 are rated. At the end of each calendar quarter, bankrate.com ranks all of the institutions that have provided listings for the 100 Highest Yields newsletter during the calendar quarter and awards Top Tier ranking to the highest three in each category, such as the 1-year CD. 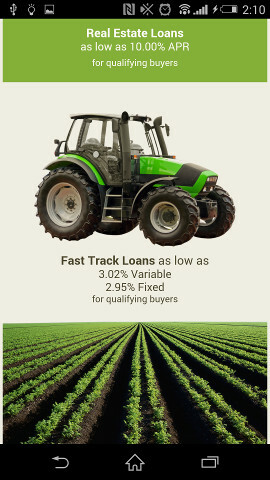 The overall rank that each institution earns is based on the number of times within the quarter that the institution's yield was among the top 20 for the product category and the relative position of the yield in relation to the others in the product category. 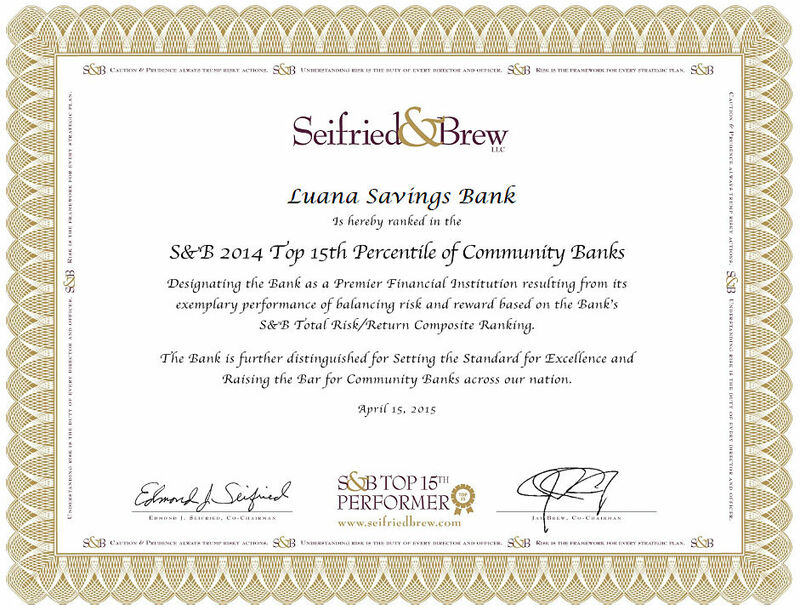 Luana, IA (April 15, 2015)- Seifried & Brew LLC, a community bank risk management firm, named Luana Savings Bank in its 2014 Top 15th Percentile of Community Banks. To gain entry into this distinguished ranking, the Bank demonstrated exemplary performance of balancing risk and reward based on the Bank’s S&B Total Risk/Return Composite Ranking. This is no small feat considering that the Bank not only survived the Financial Crisis but actually thrived. This supports Seifried & Brew’s belief that conservative, traditional community banking is the strength of our financial system. Luana Savings Bank has once again received the Bankrate.com® Top Tier award for consistently offering annual percentage yields (APYs) that were among the highest reported in 100 Highest Yields® for 1st quarter 2015. Luana Savings Bank was ranked 3rd nationally for two deposit products. Institutions that most often provided the highest yields for nationally available MMAs and CDs that can be opened by mail/phone during the 1st quarter of 2015 are rated. At the end of each calendar quarter, bankrate.com ranks all of the institutions that have provided listings for the 100 Highest Yields newsletter during the calendar quarter and awards Top Tier ranking to the highest three in each category, such as the 1-year CD. The overall rank that each institution earns is based on the number of times within the quarter that the institution's yield was among the top 20 for the product category and the relative position of the yield in relation to the others in the product category. 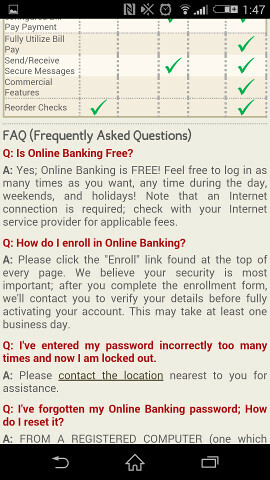 Luana Savings Bank is excited to announce that our entire website has been re-designed to accommodate viewing on hand-held mobile devices! We've been closely monitoring mobile trends for several years, and over the past few months every single page of our website - more than 80 in total - were re-coded and tested with popular mobile hand-held devices. Presentation of content on a mobile hand-held device is done through narrow, very tall pages that are 'scrolled'. A traditional device, on the other hand, has a wider display where content layout is optimized with emphasis horizontally. Traditional mobile website conversions are unfortunately many times a compromise: Mobile users receive access to limited content, and desktop/tablet users receive a less efficient, overly-simplified interface. Luana Savings Bank provides the same core content to ANY device, and hasn't changed the experience for our desktop/tablet users. Have you ever accessed a website from a hand-held mobile device and been presented automatically with a mobile version of site, but then wanted to view the traditional website? With LuanaSavingsBank.com, simply rotate your device from 'portrait' to 'landscape' mode! Luana Savings Bank has received the Bankrate.com® Top Tier award for consistently offering annual percentage yields (APYs) that were among the highest reported in 100 Highest Yields® for 4th quarter 2014. Luana Savings Bank was ranked 3rd nationally for two deposit products. Institutions that most often provided the highest yields for nationally available MMAs and CDs that can be opened by mail/phone during the 4th quarter of 2014 are rated. At the end of each calendar quarter, bankrate.com ranks all of the institutions that have provided listings for the 100 Highest Yields newsletter during the calendar quarter and awards Top Tier ranking to the highest three in each category, such as the 1-year CD. The overall rank that each institution earns is based on the number of times within the quarter that the institution's yield was among the top 20 for the product category and the relative position of the yield in relation to the others in the product category.